Ben then returned to Beijing. 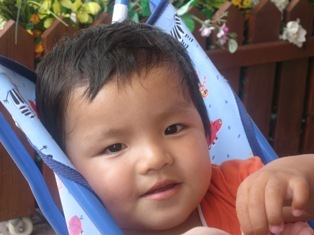 Adoption for Ben was a difficult process as the Orphanage he came from had never put children up for adoption. So MedArt was overjoyed when we hear that his adoption finally came through in 2009 and that Ben (now 7 years old) is now with his family in the U.S..
Ben is now known as Logan. He has 2 brothers. 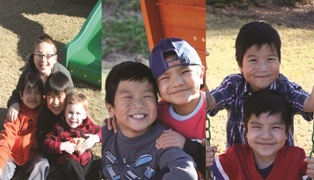 Levi is 7 and was a close friend of Ben while in Beijing. It has been amazing to reunite them. Luke is 2. The boys get along very well and seem to be very fond of one another. Since arriving his new home, Logan has received surgery for his bladder stone. He also needed a few surgeries to take care of the complications arising from the bladder stone surgery. His mother said that Logan has been through so much upon arriving home, but is handling it all very well. His mother described him as a very happy child and that he really enjoys his life. His English is doing really well and he loves school and his brothers. His parents are so happy to have him be a part of their family.